Apply to the Data Science Accelerator programme by 15 October, and you could begin developing your data science skills before the end of 2018. This award winning upskilling programme has been recognised for its impact on increasing data capability - each cohort has trained more participants than the one before. More than a hundred participants from across the country have delivered a variety of projects, many of which have made a substantial difference to their public sector organisations. Projects range from a Geospatial Risk & Impact Tool designed to help local government strategically focus their service delivery - to Classifying Businesses Using Text Descriptions by automating the process of categorising businesses using large sets of free text through machine learning algorithms. You can find more details about completed projects by checking out the directory of previous projects or our blog. Most Data Science Accelerator projects begin as proof of concept, with many becoming a part of everyday business for departments. The programme runs every four months and gives analysts from across the public sector the opportunity to develop their data science skills by delivering a project of real value to their organisation. It also highlights the benefits which data science tools and approaches can bring to respective issues and problems. The programme is backed by the Government Digital Service, the Office for National Statistics, Government Office for Science and the analytical professions of statistics, economics, operational research and social research. What happens on the programme? Your aim will be to devise and deliver a data science project that will benefit your own particular area of government. Participants will dedicate time away from their main job and commit at least one day per week for 12 weeks to your project, usually spending the day at one of the hubs in either London, Manchester, Newcastle, Newport, Sheffield or Taunton. 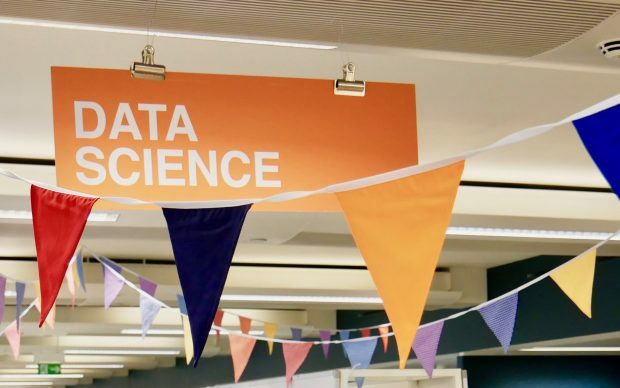 You’ll get the chance to sit with the data science community in your nearest Accelerator hub and see what data scientists across government are working on. This will also give you the opportunity to connect with fellow programme participants. Throughout the programme, you’ll be paired with a mentor who will coach you through the data challenges - and opportunities - that your project brings, ensuring you have the chance to develop your data skills and choose the right data applications for the problem you’re solving. At the end, you’ll present your work to other participants in the programme, as well as your project stakeholders. How do we choose participants? The most important thing we look for are interesting project ideas, enthusiasm to try new things and dedication to the course. Your line manager and a more senior manager (usually a Head of Profession or equivalent) must agree your project tackles a business problem with data and you can commit to the time requirements. You must also have access to the data you need before the project work begins, as without this you will not be able to complete the programme. Coding experience is desirable but not essential. The programme is not suitable for projects that aim to achieve commercial purposes. If you’re curious about which projects we’ve accepted onto the programme before - remember to take a look at our directory of previous projects. For more information on key dates and to apply for the programme, visit the Data Science Accelerator page by Monday 15 October.